This month marks the eighty-second birthday of the great American composer George Flynn. A longtime professor at De Paul University now retired, Dr Flynn has continued to arrange and participate in an annual contemporary music concert and birthday celebration. 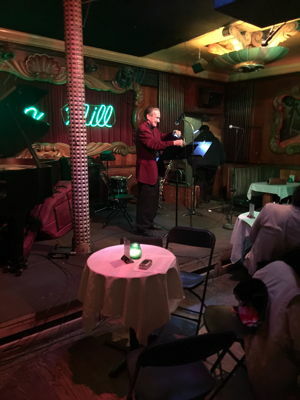 This year it will be held on 27 January 2019 at The Green Mill and will include new music by a very large collection of composers. But, the Green Mill is no average bar. It is a remnant of the Prohibition, was a speakeasy, and was intimately connected with the 'ganglandscape' of Chicago. No less than Al Capone had a favourite booth here. Beneath its floors were 'party rooms' and tunnels to other more reputable places so that patrons could escape undetected. It looks quite plain at Google Maps, on a rather dismal street, but much lurks there. Much. And so, in this implausible, improbable and incredible location, one can this month hear samples of modern music - and not just jazz. Indeed, I wonder if any of the works, apart from their improvisatory elements - would be considered jazz by an aficionado of that genre. 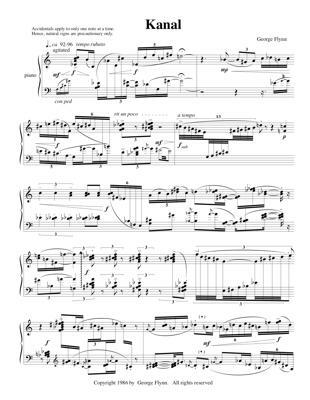 To clarify: George Flynn is best known as a composer of vast, demanding and advanced music for solo piano which requires the greatest virtuosity to perform. Himself a stellar pianist, his works have been recorded by a striking array of modern super-virtuosi such as Carlo Grante, Geoffrey Madge, and Fredrik Ullén. Flynn's compositions are the product of an overwhelming imagination, extreme vehemence of emotion and demanding musical language. Flynn's music is propelled by self-similar gestures (gestures similar to their pads, for many time scales), loosely anchored to pitches and pitch class aggregates. This is the kind of composer we are talking about! Please note, that Dr Flynn has also written many other works in a variety of genres, for a wide array of instruments. Many of his works are available for listening at: www.classicalconnect.com. Each selection comes with a brief description by the composer. The main website provides detailed lists and available recordings. And as for the concert program, one can imagine that his selection of music for this concert mirror Flynn's own proclivities, and whatever the style of he composer, this means intelligent intention, great musical understanding and sure technical expertise. Flynn has long been a supporter of other and younger composers. The 27 January 2019 concert contains a large number of both. At the bottom of the page are some links and information. Performers will include Thomas Winthrop Stevens, piano; Evan Snyder, voice/electronics; Alyson Berger, cello; Amy Wurtz, piano; Kuang-Hao Huang, piano; Vicki Milewski, voice; Joanie Pallatto, voice; Bradley Parker-Sparrow, piano; Bradley Robin, piano/fixed media; Natasha Bogojevich, piano; Janice Misurell-Mitchell, voice/flute/electronics; Brandi Berry Benson, violin; Kurt Westerberg, piano and Doug Binkley, poetry, parody/homage and humor. George Flynn will be represented by two sets: the piano work Journey to Serenity, which he will perform, and then a set entitled Flynn-isms for voice and piano. Much of his work reacts against political and historical events. In these trying days, the prospect (and practice) of inclusion is a very kind and promising one. I would invite you to be there if you are nearby to Chicago. I would wander in and take a gander at Al Capone's booth, then sit far away from it. As they used to say: 'If the walls could speak'. Well, on the 27th they will vibrate with a very different sound that adds to the dialogue and the connection. We need, these days, to both speak well and listen better. I think the conversation will be very civilized on 27 January at an old and legendary speakeasy. New Music at the Green Mill - Sunday 27 January 2019, 2-5pm at The Green Mill, 4802 N Broadway St, Chicago, IL 60640, USA.